With a history dating back over 200 years, Pirastro strings have a reputation for high quality, reliability and the best sound. Professionals, teachers and students worldwide all reach for Pirastro with confidence and the knowledge that each string has been produced using the finest materials and computer aided design. 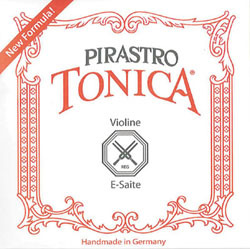 Pirastro are known throughout the world for the tonality and quality of their strings. They offer comprehensive choice for the musician from gut (Oliv) to synthetic (Tonica, Evah Pirazzi) or steel (Chromcor). Pirastro produces strings to suit every style of playing from a complete range of gut strings (Passione and Oliv), to synthetic strings, such as Evah Pirazzi or Tonica and including steel strings (Flexocor and Chromcor). Pirastro strings are available for violin, viola, cello and double bass as well as for harp and other stringed instruments. Pirastro ensures the quality of its strings by its stringent production controls and choice of first class materials. The tonal flexibility and expressive power of Pirastro strings enables the player to bring out the best in their instrument. For details of individual Pirastro strings see the Pirastro website.